Waffles are often tricky to make, and while the majority of what I’ve tried is of a simple design—based on what a motel can offer cheaply—to have the real deal requires the love of grandma’s home cooking or the imagination of West Coast Waffles. And it was the delightful scents (and one enormous appetite to sate) that attracted me to this place. The Wake n’ Bacon ($8.96) was definitely hearty, and the batter was infused with a light taste of two different types of cheeses. Given that Monterey Jack and Cheddar can be two strong flavours, I think they used virgin cheeses than aged to make the flavour balanced. 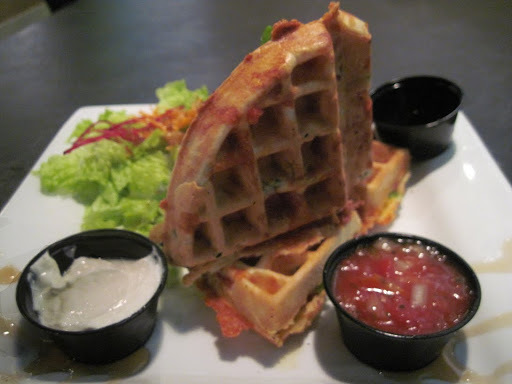 The waffle itself had a nice soft crisp to it, and I savoured the bacon. It was beautifully cooked up and it came through nicely with a double dose of maple in both the pork and dip. It’s possible to ask for 100% pure maple syrup, but to really customize this meal I’d have to revisit this place to try the other options. Given the size of these waffles, I can only do one in a single sitting. Since the dips are offered as a side, I was glad I could pick and choose what I wanted. It’ll take a while for me to get used to sour cream on a waffle, but I was completely sold on the salsa. The presentation is top notch and I’d have to say these boys here definitely have an art style down. With that kind of sporting attitude, this place is worth coming back to time and time again. They even have plans on expanding to other locations like Vancouver, Whistler, Calgary and Seattle once word spreads. And another Victoria outlet is not out of the question. Because of the winter season, they’ve shut down their cart operation on Cook Street but come spring, to walk down Dallas Road with a waffle taco sounds appetizing. As for what I want to try next, there are plenty of choices to consider. 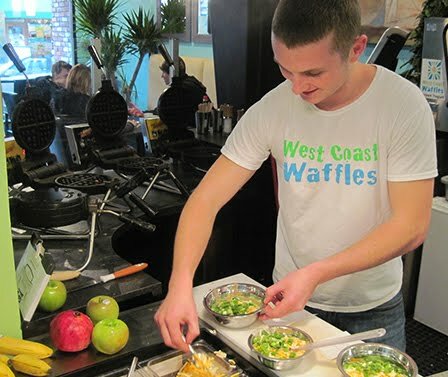 Customers can ask for fruits, yogurts, nuts or sweets to go with their waffle, and their batter comes in three different styles — the original using free run eggs and organic flour, the buckwheat special or rolled oats. There’ll even be a vegan batter offering so anyone with dietary restrictions can even enjoy the much coveted waffle. That’s on their priority list right now. And for an operation that’s only a few months old (they opened this past August), they’re certainly creating a following. They began as a street cart operation and were very quick to grow into a storefront. But when Spring 2011 hits, I’ll be here to savour the strawberries. There’s nothing like fresh locally grown berries, and maybe I’ll just leave James in the dust since I can’t always wait for him. Today, he was still recovering from his cold and hibernative state than to come downtown on a nice sunny day. You’d think he’d be losing some weight, but his teddy is going nowhere. In the meantime, I’ll have to hit this place up again for the Johnny Mac waffle. Mmmm, Bacon and Brie. Maybe I should call this place a heartache waiting to happen. This entry was posted in Food, Reviews and tagged Breakfast, Downtown Victoria. Bookmark the permalink.